You don't need any fxb-files/patches or banks to activate the correct behavior of the SDFX plugin. Whoo, you really get a headache from this. Sorry. What I did mean was that there exits no fxb/fxp - patches for download in the SDFX Drum Sample Library or in the Library patches wich you can load into the SDFX for correct working. I forgot to mention that the library path in the system-slot is not a global parameter. As you realize it can be saved unique for every SDFX program. This behavior allows every SDFX program to use his own library/path with his own text files for controlling the sample-slots. This enables the user to build his own Drum Sample Library independently from the delivered standard library. So you need to change the library path for every SDFX program and save it as a fxb-bank at the end. It is not possible to overwrite the default SDFX settings and programs. You need to reload your user bank if you want to use your own settings and programs. On the most DAW's the user bank is automatically reloaded with the song or project file. Shure you can set this behavior in the DAW's options. Greetings and thank you for your experiential report. PS: Sorry for setting you on the wrong track. Just go to the System-Slot on the SDFX user interface. 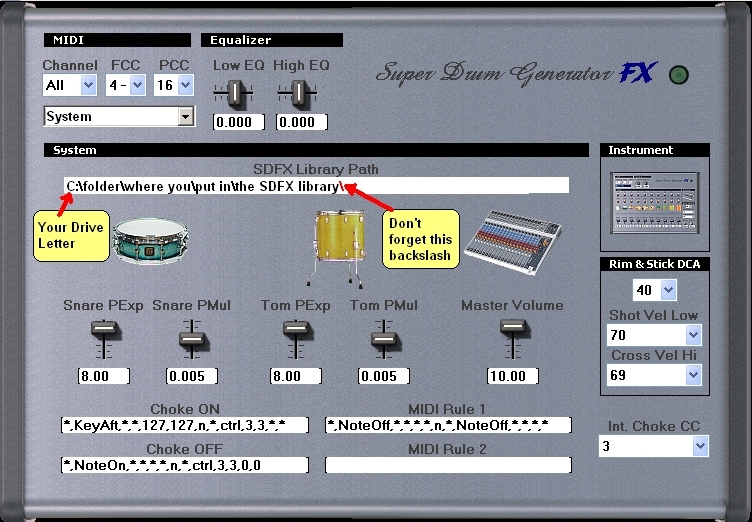 (choose it by drop down list elementI and enter the correct path to the SDFX Drum Sample Library. PS: The difference between a fxp-Patch and a fxb-Bank is that in a fxp-Patch you can only save one instrument. In the fxb-Bank you save all instrument patches of the whole VSTi instrument. 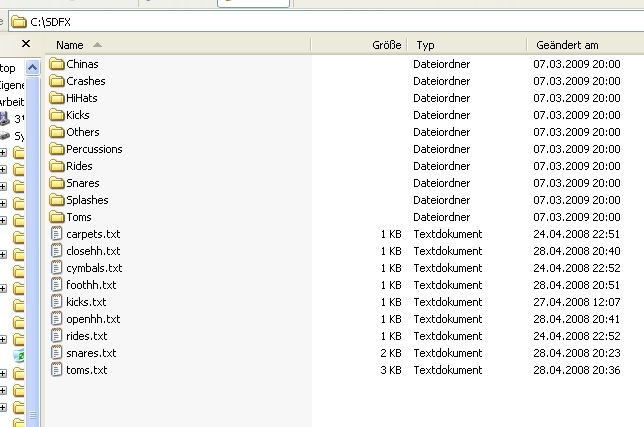 I removed all the superdrum VST folders and files from my computer and re downloaded everything and started again from the beginning. This time, I put the text files in the SDFX folder and the path, in the SDFX Library path system slot as specified in your answer above. Although this did mean the samples did play and were correctly listed in their respective individual drum slots.. I found that when I changed program (say from Sonar set to Dunnett Stainless) the path to the SDFX folder was not listed and had to be entered for each different program title. Having done this, I then discovered that changing program name made no difference the first kit continued to play and be listed in the individual drum slots, no matter what other kit I selected. Interestingly, the reverb settings i.e. DW dark kit changed but not the drum sounds themselves. I then changed to my VST host's (Samplitude Music Studio 14) supplied drum module, to test the difference between how that and Super drum sounded. I discovered, that when I changed back to Superdrum as my drum module, it had forgotten the folder path had put in the System slot and I had to re- enter it again. It was while experimenting with this that I discovered this other little idiosyncrasy. If I chose Titanium for instance, I would still have the Walnut kit playing and being listed in the individual drum slots for snare high hat etc.. It would only remember the first one. In order to change this, I had to deselect Superdrum as my drum module and then reselect it choosing another kit before entering the library path in the system slot. I had to do this for each program, in order to get them to play and list the correct wave files in the individual drum slots. What I had to do in the end, was to save each program as an fxp patch, then reload them back (making sure to select the same program name as the bank I was about to load) into the program then resave the list as a new bank fxb patch which I named Original Sound Set. When I load that self created bank into the program, everything works fine.. It does have the minor inconvenience, that when you select the Superdrum as your drum module via your VST host program, it comes up with a blank system slot path and you have to load the bank in every time you use the program. I don't know how to make it default to the Original Sound Set bank I created upon opening. I also used one of the spare default programs to create a brush kit set from the New Sounds wave files provided by one of your users ( I manually entered all wave file locations for each drum) but though I saved it as New Brush Kit .fxp when I load it into the program it still displays itself Default 10 in the program list, though the sounds play correctly. I don't understand why that is happening either.. Anyway hopefully this information on my experiments, might help other users, who have found some problems when using the program and trying to get the correct wave file to play with the correct kit.. I don't know why I had such difficulties in installing it. Maybe something to do with having the Vista operating system but hoping this feedback is of some use to you.. It's a great program when you get it going with great potential for creating your own sound banks. I don't know whether you think this might be worth including in your tips and trick section but during my experiments, I discovered that I could actually have my music programs internal drums playing and by copying the midi information to another midi track, I could then have the Superdrum play simultaneously, opening up lots of of layered snare and other sound stacking possibilities. You can even just copy the kick and snare midi information and have super drum add it's unique qualities and reverb to just those sounds. Hi I am trying out super drum under Sampltude Music studio 14 on Vista Home Premium and I have the same problem as mentioned earlier in the forum thread. The paths to the samples are empty. How do you get round this? I have found away to make the samples play by manually entering the paths to the sample for each drum and then saving them as an fxp patch. On some of the preset program patches, I can work out which sample should go where by reading the text files that came with the downloaded the library patch (Ludwig, Titanium and Walnut snare etc but on others, I don't have a clue, such as Vintage power or John Bonham... Also it is not always clear which High hat or kick goes with which kit. Also what is the difference between a patch and a bank I have no idea what information each type of file should contain or what they tell the program to do. There were no fxp or fxb files in the zip files I downloaded they are only created when I choose to save a patch myself,. This is how I have been using the program I have been saving my own fxp patches and loading them when I use the program but I am not sure I am seeing it at it's best this way.. I have saved no bank patches, as I don't know what they do.. The sounds are great, I love the way you have allowed such controll over the drums and I would really like to give this program a fair trial.